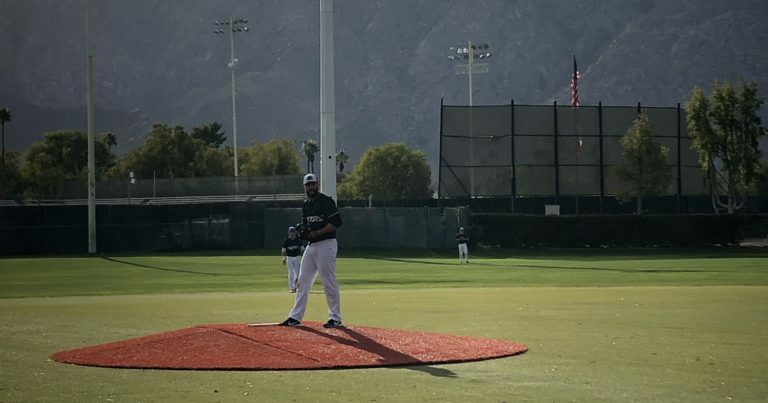 In the days first game over on the auxiliary field, the Palm Springs Power shutout the New York Colonials 3-0. Konner Arnold went the distance for the Power, allowing five hits and a walk over seven scoreless with 11 strikeouts. For the Colonials, Shoji Murayama took the loss, but allowed just two runs on six hits over six innings with a walk and two strikeouts. The game remained scoreless until the top of the fifth inning, when the Power put together three doubles leading to a pair of runs. Clayton Conner’s one-out double started it, he then scored on Nicholas Michaels’ two-out double. Michaels came into score on Won Jie Choi’s double to give the Power a 2-0 lead. Palm Springs rounded out the scoring in the seventh inning after a two-out Choi single. Michaels finished 2-for-3 with a double, a run, an RBI, and a walk. Choi finished 2-for-4 with a double and two-RBIs. Jacob Boston finished 2-for-4 with a double. In the auxiliary fields second game, the Oregon Lumberjacks took down the Washington Blue Sox 3-2. The Lumberjacks remain the only team without a loss, and they used a strong pitching performance from Jordan Brown to pick up their fifth win. Brown allowed two-runs on five hits over seven innings with five strikeouts. Reinaldo Gonzalez scored the games first run on a wild pitch to give the Lumberjacks a 1-0 lead in the top of the first. Oregon extended their lead to 2-0 in the fourth after Shintaro Yokota walked with the bases loaded. Tatsunori Negishi drove in Kyle Stahl to cut the Blue Sox deficit to 2-1 in the bottom of the fourth. The Lumberjacks went back up by two in the top of the sixth, as Tanner Helms drove in Joshua Rodriguez with a single. Washington rounded out the scoring in the bottom of the seventh when Yuki Nagao reached on an error to drive in a run. The Blue Sox had the tying run on second with two-away, but Yuki Nagao was thrown out trying to steal third to end the game. In the days only game at Palm Springs Stadium, the Toronto Rush shutout the British Columbia Bombers 4-0. The Rush were helped out by a strong start from William Myers, who allowed just one walk and one hit over six innings with nine strikeouts. Myers also retired the last 15 hitters he faced. The Rush scored the games first run in the bottom of the first. McClain Bradley drew a one-out walk, stole second, moved to third on a throwing error, then scored on Jesse Russo’s two-out infield single. Glenn Kubek drove in Russo with a two-out single in the third to run the score to 2-0. In the fourth, Dominique Lincoln drove in a run with a ground-out, and in the sixth, Bradley drove in a run with a single to round out the scoring. Bradley finished 2-for-3 with a double, an RBI, a run, and two steals. Russo finished 2-for-3 with a double, an RBI, and a run. In the final game of the day over on the auxiliary field, the Alberta Grizzly took down the Manitoba North Stars 5-1. Alex McCune allowed just one run over six innings for the Grizzly. The Grizzly scoring started early. In the bottom of the first, Ryan MacCarrick was hit by a pitch with the bases loaded to force in a run. Later in the inning, Colten Trager walked with the bases loaded to give the Grizzly a 2-0 lead. The Grizzly bats stayed silent until the third when Trager walked again with the bases loaded. In the fourth, Hardin drove in a run with a single, and Bill Pearson drove one in with a two-out double to extend the Grizzly lead to 5-0. Judah Wollenburg drove in the North Stars only run with a double in the fifth. Saturday at the California Winter League will be Sun & Suds Saturday, featuring $2 Bud and Bud Light Drafts. Game one at the stadium features the Manitoba North Stars @ the Oregon Lumberjacks at 10 AM, followed by the Toronto Rush @ the Palm Springs Chill at 12:30 PM.